Blockchain is no longer a technological dream of the future; it is in the present, already transforming the world as we know it. It is no longer only technologists in niche spaces taking blockchain seriously; the Indian Government is partnering to host the biggest international blockchain event India has ever seen. We hope that this event can demonstrate the value of supporting and implementing initiatives in the blockchain space to other governmental and regulatory bodies. We aim to showcase the incredible potential of blockchain as well as highlight the breakthroughs that are already occurring at the International Blockchain Congress. 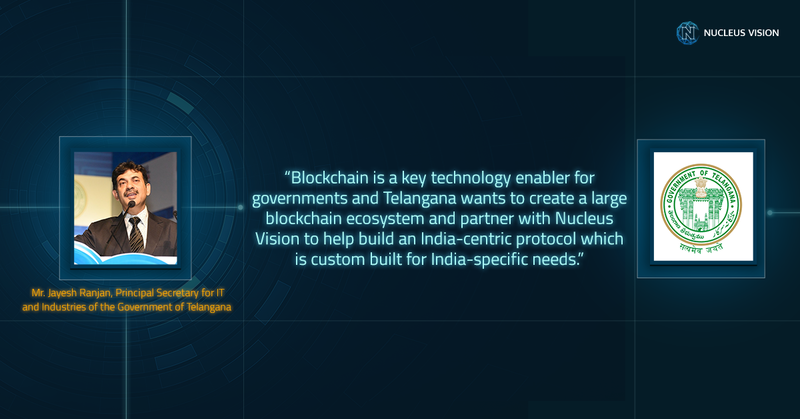 In collaboration with the state government of Telangana (an Indian State with over $130 Billion in GDP) and Nucleus Vision, the International Blockchain Congress will be the largest conference to bring government officials, industry experts, and technology innovators together on a single platform. The International Blockchain Congress will be a two day conference, welcoming more than 2500 attendees with a strong representation from the government’s IT and planning commission. Visionaries and thought leaders will have the opportunity to meet the people in government with whom true collaborations can take place. From industry leaders to startup innovators, the International Blockchain Congress will be teaming with industry experts with both startups and several established companies. We will also have pitching sessions for teams and early stage startups. Learn key insights from those who are already making big things happen as you prepare to launch the next big idea in the blockchain space. With internationally acclaimed speakers, informative and engaging sessions, and several networking events, the International Blockchain Congress will provide ample opportunity to make important connections. The conference will have over 100 local and international media outlets covering the event. For the first time ever, there will be a proactive interaction between industry experts and government regulators, who will come together to have the most important technology discussion of our time: how to bring the blockchain to the masses. There will be discussion, panels, which will forge synergies between important industry leaders and government officials. Be a part of this seminal moment in India’s technology roadmap. Contact info@ibc.vision for more details. About the state of Telangana — The Indian State of Telangana is one of the most progressive and technologically advanced states in India. With a GDP of over $130 Billion, the state is the Indian home base of the world’s biggest technology giants, including Google, Facebook, Apple, Qualcomm, Microsoft and several others. Hyderabad, the capital of Telangana, is also India’s most connected city with the highest tele-density. Having more than 350 Engineering colleges, nearly 50 thousand engineers graduate from the city of Hyderabad alone.